The industry’s most versatile rehabilitation tool, the SciFit PRO2 Total Body Trainer is an upper body exerciser and lower body recumbent bike. Dependent upper and lower cranks enable passive assistance. 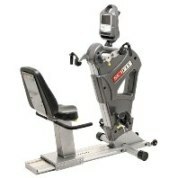 Some key features include: knee-to elbow motion for cardio to the core, easy access with true, adjustable step through, removable seat for wheelchair accessibility, standard adjustable and bariatric seat options, therapist assist pedal on adjustable seat, bio-directional exercise, iso-strength safe, and a very low starting resistance.